But the resolution also had a dark underbelly: It made mockery of judicial process and history, and exposed racism and double standard. Potentially it will increase racial strife in German society. It also opened a Pandora’s box for Germany. Altogether it was a major blunder for the Bundestag. This article was originally written by Dr. Ferruh Demirmen on June 21st. Why was there a mockery of judicial process? Genocide is actually a legal term and according to the 1948 UN “Convention on the Prevention and Punishment of the Crime of Genocide,” persons charged with genocide should be judged by a competent tribunal. That is what Article 6 of the Convention says. Cognizant of the UN Convention, the European Court on Human Rights (ECtHR), in its 2013 and 2015 rulings on the Switzerland-Perinçek case, noted that Armenian genocide is disputed among the scholars, and hence not an established fact. France’s Constitutional Council likewise affirmed in its ruling on January 8, 2016 that an event cannot be considered genocide unless established by a competent court. Hence parliaments have no authority to rule on genocide. Further, the retroactivity clause (“No punishment without law”) embedded in the European Convention on Human Rights (ECHR) bars application of a law to a crime that preceded it. The Convention went into force in 1953. By its vote, the Bundestag violated international covenants and judicial rulings. It also violated Germany’s Basic Law (Grundgesetz) as regards the presumption of innocence and retroactivity. The Bundestag resolution makes sweeping accusations as to the deportation and “intentional mass killing” of some 1.5 million Armenians by the Ottoman government. The only “evidence” cited for these accusations are the works of “independent” researchers and the April 23, 2014 condolences extended to Armenians by the then-Turkish PM Tayyip Erdogan. But who are these “independent researchers?” Presumably mainly the so-called “International Association of Genocide Scholars,” a biased group that refuse to debate the issue with their opposing counterparts. Probably also some Armenian apologists that cropped up in recent years in Turkey – thanks to support from EU organizations such as the Konrad Adenauer Foundation. This argument ignores the vast majority of historians, both Turkish and foreign, that reject the genocide narrative. Among those are the 69 US experts on Turkish, Ottoman and Middle East history, among them the eminent historian Bernard Lewis, that issued, in 1985, a joint declaration rejecting the “Armenian genocide” narrative. In 2011 124 Turkish academics signed a statement supporting the 1985 declaration. Does the Bundestag think the opinion of these academicians is worthless? As for referencing Mr. Erdogan’s condolences, it illustrates how a well-intentioned declaration by a Turkish leader is abused by Armenians and their sympathizers toward their ill-founded accusations. against the Namibian natives during 1904-1907. But such parallelism would be baseless. In terms of intent and the circumstances, the 1915 events in Anatolia and those in 1904-1907 in Namibia cannot be compared. German General Bronsart von Schellendorf, who was the deputy to the War Minister Enver Pasha in World War I, detailed in a 1921 article published in “Deutsche Allgemeine Zeitung,” how the armed Armenian guerrillas were cooperating with the advancing Russian army, paralyzing the Ottoman defenses. Relocation of the Armenian population from the war zone was the only sensible military recourse. The top military decisions during the war came from Berlin through General Schellendorf. Written orders by the central Ottoman government sent to the provinces leave no doubt that the relocation had no intent to harm the Armenians. Further, Armenians in the western provinces were exempted from relocation. Compare that to the situation in Namibia where the German colonizers did not face an invading foreign army, but still decided to wipe out the native Herero and Nama tribes because the latter had revolted against an oppressive colonial rule. Enslavement, slave labor and malnutrition were widespread. Some two thirds of the native population was killed. And how can the German lawmakers reconcile their “Armenian genocide” accusation with the fact that Armenians had lived peacefully with the Ottomans for centuries and occupied high government positions: 22 ministers, 33 parliamentarians, 7 ambassadors, 11 consul generals, 11 university professors, and many military officers. As late as 1913 the foreign minister in the Ottoman cabinet was an Armenian. How many high-ranking Jews were in the Nazi government? And why would the Ottoman government, if it were intent on exterminating Armenians, prosecute persons that had committed unlawful acts against Armenians? The 1915-16 court-martials held by the Ottomans convicted nearly 1400 persons for disobeying government orders during relocation. The penalties handed included 63 death sentences. How does that compare with the treatment by the Nazi government of, say Waffen-SS, that killed Jews and other “undesirables” during World War II? A reading of Professor Heath Lowry’s findings on the source of baseless accusations made by German Protestant missionary Johannes Lepsius, that the lawmakers use as a reference, would also be very edifying. Death and sufferings befalling the Armenian side were due to lawlessness, exposure, disease and famine. Turks have never denied these tragic events; but calling these events “genocide” is totally baseless. The German lawmakers should also know that the UN has refused to recognize the 1915 events as genocide. But they also revealed appalling callousness toward the loss of Muslims during that tragic period. Separate from the fact that the claim of 1.5 million Armenian losses during the relocation is a grotesque exaggeration, the parliamentarians could have shown more credible humanity by expressing some compassion for the Muslim losses as well. Leaving aside deaths from other causes, and also leaving aside ethnic cleansing of Muslims in the Balkans during 1912-13, between 1914 and 1919 more than half a million Muslim civilians died at the hands of armed, marauding Armenian bands. It was horrifying savagery. Do the German lawmakers think Muslim losses don’t matter? Expressing compassion for Armenian losses while overlooking the loss and pain on the Muslim side is outright bigotry. It is, in fact, racism. If it is any consolation for the Bundestag, such selective morality is not confined to Germans. It is an affliction that runs deep in the West. Just as Pope Francis may have foreshadowed last year while commemorating the supposed 100th anniversary of Armenian “genocide,” are we at the dawn of a new, post-modern crusade against the Muslim world? Or is this another facet of Islamophobia? In their resolution the German lawmakers give gratuitous advice Turkey, that it should face its history and resolve its differences with Armenia. the German guilt in the Namibian atrocities. Although Heidemarie Wieczorek-Zeul, Germany's development aid minister, accepted in 2014 German responsibility for the Namibian atrocities, a recognition by the top German leadership and the German federal parliament is still missing. It appears that the Bundestag sidestepped the Namibian imbroglio so as to not to contradict itself. For if the 1915 events were genocide, the Namibian atrocities would have been indisputably genocide as well. However, considering the 1948 UN Convention as well as the retroactivity restriction in law – not to mention ECtHR’s Switzerland-Perinçek rulings – genocide characterization for the Namibian events would have been inappropriate. The Bundestag was careful to stay within the international norms. But if the Bundestag is so scrupulous about the international norms on the Namibian events, why did it disregard these norms in the case of the 1915 events? Why such double standard? The high-minded German lawmakers should have also admitted the role their moral clients, the Armenians, played in the Nazi ranks during World War II. The Nazi-Armenian Legion under the command of General Dro Drastamat Kanajian, a force of 22,000 to 33,000 men, many of them SS troops, served Hitler from 1931 to 1945. “Dro” himself was a war criminal from the time he was a guerrilla leader in eastern Anatolia. So, Armenians are no saints! Astonishingly enough, the German lawmakers promoted the inclusion of Armenian “genocide” teaching in school curricula. Noting that so far only one federal state (Brandenburg) had implemented such curriculum, they argued for wider implementation. The lawmakers appear to be oblivious to what that might mean for domestic peace. There is little doubt that the “genocide” curriculum – apart from telling a lie - will increase religious and ethnic strife in a country where there are 3 million ethnic Turks. It may also serve as fodder to the Neo-Nazi movement. More Möllns, more Solingens, more Turcophobia! Ethnic tensions are simmering in German society. In an attempt at magnanimity, the German lawmakers “regretfully” accepted Germany’s responsibility for the 1915 events. They noted that the German Empire, an ally of the Ottoman Empire in World War I, did not interfere with the 1915 events, and apologized to Armenians. But in so doing, the Bundestag opened a Pandora’s box for Germany - an unintended consequence. 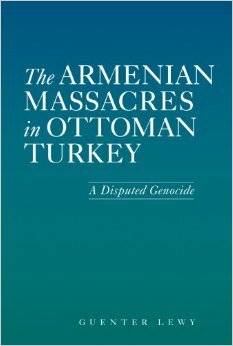 For if the 1915 events indeed constitute genocide, Germany may be viewed as a co-conspirator, and liable to pay restitution to Armenians. Since Germany has no territory to cede to Armenians, and since the Bundestag has already apologized, that would mean monetary compensation. And a princely sum at that! Voila! It remains to be seen how this scenario will unfold. Turks will be watching in delight. migrant crisis, but in part also due to tension created with Turkish President Erdogan. The Bundestag undertook the “genocide” resolution with the intent to punish Turkey. But the German parliament became carried away when it entered into territory it should not have. Exceeding its authority, it acted as a tribunal of law, mocking international norms. It ignored historical facts, while at the same time exposed racism and double standard. Fueled by a combination of Turcophobia and Islamophobia, the resolution had a dark underbelly. One is tempted to ask: What would the German parliament’s attitude be if in 1915 the perpetrators were Christian and victims Muslim? A similar question could be directed to other Western parliaments. To answer this question, one need not go farther than the recent past: The Srebrenica genocide and the Khojaly massacre in the 1990s. Or shall we go some years back and ask what happened to the Crimean Tatars? History is replete with duplicity. Considering all, the Bundestag resolution was a disgrace, and should be rescinded. It should be rescinded if for no reason than to honor truth. It will in no way help Turkish-German and Turkish-Armenian relations. Western nations should face their own history before lecturing Turkey.